When we first down with a client for the first time, the first thing we like to try and get an understanding of fast is their overall digital marketing strategy and how whatever work we are carrying out for them – be it a new website or taking over their social media management – fits in with that overall plan. Sometimes however, we come across clients who might already be doing some work in terms of digital marketing but with no overall strategy and so we start to help them develop such a plan for the first time. We thought it might make for a useful series of blog to spend some time over the next few weeks talking about what makes for a sound digital marketing strategy and how we can begin putting one together. The first thing to grasp right at the start of this process is the difference between the terms above. While they may sound – at first glance – interchangeable, each terms refers to a very separate part of the same process. The objective will here refer to the overall objectives of the business. This might be “to raise awareness of a new retail location”, or “to increase sales by 20% next year” or “to develop a new product”. So these are our stated business goals, but don’t talk to how we plan on achieving them. When we use the phrase tactics, here we will be referring to specific, discreet pieces of activity that we will be utilising on a day to day basis. Examples of something that might be defined as a tactic might include “running a campaign of Facebook advertising” or “recycling great customer feedback for email blasts and twitter posts”. So these will help us in our quest to achieve our objective but not in isolation. Finally – we have what we will refer to as our strategy. Our strategy is our overarching marketing plan that in theory; that should provide the infrastructure and road map to join up our tactics and realise our marketing objectives. Lets put that into context for a moment: here’s Brian. Not at all a stock photograph. Let’s say for the sake of this discussion that Brian runs a pretty rad clothing shop. He seems a pretty cool guy and you can see from the presence of his laptop that he’s already hopping on this digital marketing train. His stated objective is to expand sales of his (no doubt super rad) clothing in 2018 by 25%. His strategy for doing this might be to open a new e-commerce website to sell his products online (in addition to his physical bricks and mortar premises) and to use social media as a way of generating traffic for that site. Its very important to try and remember at each step of the process the difference between these three terms and how they all relate to each other. 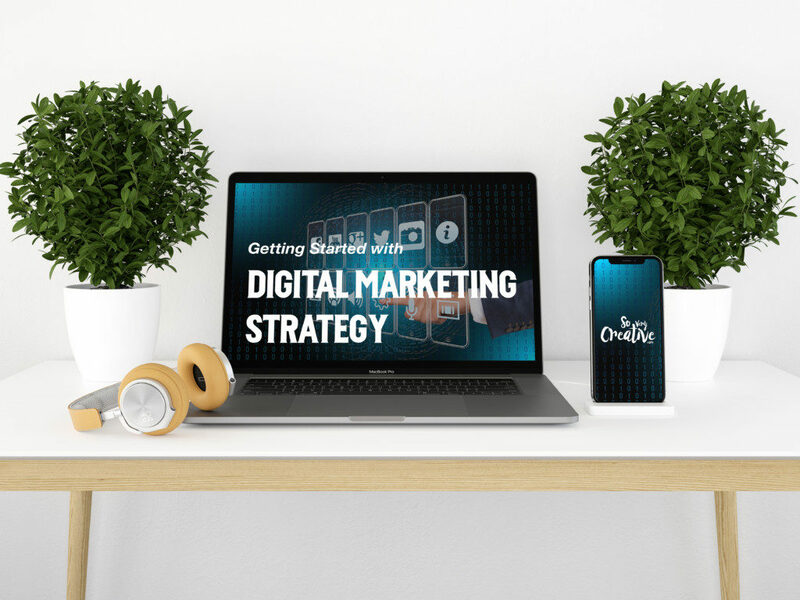 Next time in this series, now that we’ve identified what a strategy actually is we are going to look at the essential pillars of a sound digital marketing strategy before spending some time over the coming weeks, discussing each of them in turn. Subscribe to get future updates right to your inbox!